You have to admit... our planet is definitely something unusual compared to anything else we've seen so far. We may yet find a comparable planet somewhere out there, but the parameters for life as we know it just seem so exceedingly narrow. And then, according to NASA's guess at the speed of our galaxy and all, our Earth may be traveling at a tenth the speed of light! Makes you think... could our planet be something more? Maybe precisely placed in it’s orbit? Do you believe in Keplar theory? Polar reversal? How about carbon-dating? Think we know what matter is? Energy? Most of our science is completely based on assumptions-... let’s twist what we ‘know’ a bit. Well, perhaps us surface lifeforms aren’t the only ones traveling on our world-ship. We might not be the intended passengers and our solar system might not even be the intended destination. Indeed, stories and legends surrounding what may lay beneath the surface have been around since stories and legends began. Here’s another! Sure enough... we mess up the ship's drive and our technology interferes with the Link to the Being's minds. Combine that with the malfunction of an ancient Reptilian device and the Beings find themselves in trouble... an attempt to salvage the situation just ends up in loss of control of the ship. Now, we on the surface are already dealing with world climatic change; earthquakes and disasters. Worst yet, we are expecting an immanent magnetic pole reversal and an upcoming ice age. We think we know why it's happening! So, we try a massive project to stabilize the magnetic poles- only to end up finishing the damage the Beings did themselves. We Humans only know a fraction of it- the Earth’s magnetic field has completely halted. It is getting colder and calamity after disaster shake the planet. Cosmic radiation bombards the surface. But the truth is far more terrible. The ship's drive is dead and the planet is careening out of orbit. What follows is the find of our kind’s existence. Meanwhile, the Beings are preparing to die, and guess who they find sneaking around? Surface life down there is unpopular, to say the least. And still, we seem to have the answer to the Being's dilemma. So begins a wildly new future for mankind. There is strife, unrest and even war to come, but at the same time friendship and change as 3 completely different species learn to help each other. This story is about man's journey to an imaginary future. It is about a creator-mankind relationship. It is about a great quest of might-have-been circumstances. And, best of all- it has dragons! Click on these links to preview! Viviquary begins with events that precede even the ‘Big Bang’. 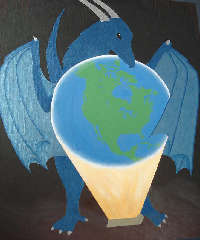 A race of dragon-like Beings discover a wonderful and rich new Universe- ours. And like we would certainly have done ourselves, they exploit it- exploit it until it is destroyed. As the cosmic repercussions of what they’d done swept across the universe, their kind was wiped out. But not their children. Almost a thousand Being younglings sleep in stasis deep below the polar region of a planet-sized rescue craft- our Earth. The navigation system and magnetic drive have fled cosmic disaster for nearly a million of our years. Now, the ship is recharging at a nearby star, finally approaching a safe haven for them to return to. And, naturally, the Beings are restless, starving and bored. We surface dwellers began as mere sensors for the ship, but soon began evolving. Certainly, much of that evolution was due to extraterrestrial interaction- Reptilian visitors not all that friendly to what the Beings had done to the universe. But however it happened, in the time frame of the Beings, we Humans evolved instantly, and all of a sudden became a terrible threat to their technology and the entire ship! A reliquary in which the artifacts are ALIVE- find out in the Viviquary series of novels! 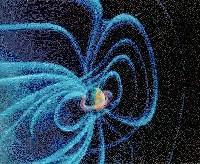 The Earth’s magnetic field- look like some kind of propulsion to you?